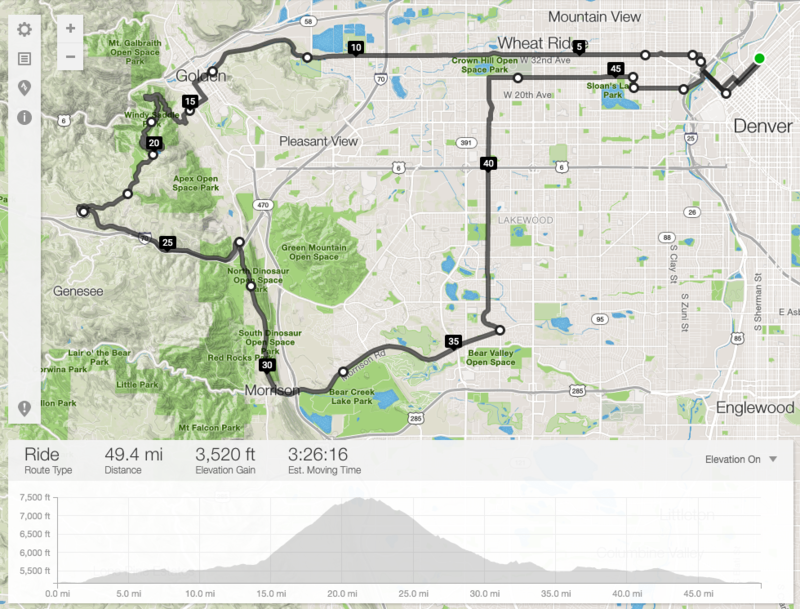 This route starts in River North Art District (RiNo) in Denver, CO. It takes riders past Coors field, home of the Colorado Rockies Baseball Club, and near Mile High Stadium which is home the Denver Broncos. The ride continues into Golden, CO past Coors Brewery and the Colorado School of Mines. This begins 7.2 continuous miles of climbing. After climbing a 4.7% average grade of switch backs and breathtaking views, riders are welcomed to the focus point of the route at mile 20. Atop Lookout Mountain sits Buffalo Bill’s grave site. As it is an area for tourism, restrooms and a gift shop with access to plenty of water, drinks, and snacks are available. The views extend for miles and takes in the entire Denver skyline. The ride extends down the backside of Lookout Mountain with fast descents that will bring riders into full tuck mode. At mile 31, there is a Circle K frequented by cyclists and motorists alike. After fueling, the ride descends back into Denver and to a full array of after ride options. Within two blocks of the start/finish point, riders will find cycling-favorites like pro cycling chef Biju Thomas’s Little Curry Shop, Define Cycling, and Huckleberry Roasters where you can grab a one-of-a-kind espresso and cycling cap.